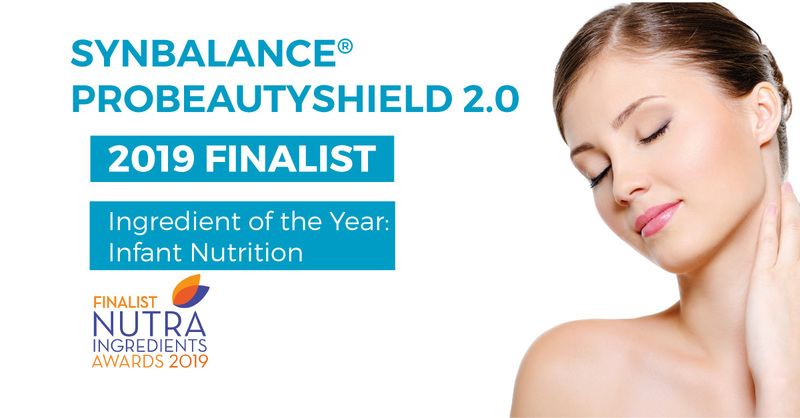 We are honored to inform our customers about the recognition of SynBalance® ProBeautyShield 2.0 as finalist in “Ingredient of the Year: Infant Nutrition category” during NutraIngredients Awards 2019. Owned and organised by NutraIngredients.com, the awards reward true innovation and cutting edge research in healthy foods, supplements and nutrition. The finalists will be showcased on the NutraIngredients stand at Vitafoods, Europe 2019 for three days in May. The winners will be announced and presented with their trophies at a glittering awards dinner on Wednesday 8th May at the Starling Hotel, Geneva (after the second day of Vitafoods Europe). ROELMI HPC, expert of biotech processes applied to selected probiotic strains, to obtain ingredients with highly innovative and scientifically backgrounded character, launches SynBalance® ProBeautyShield 2.0. High potency probiotics complex (LP, LR and LRh) designed for skin protection from within, able to positively modulate skin physiology through gut-skin axis interactions, exerting anti-inflammatory & anti-microbial activity and protection against external aggressions. Targeting skin health from inside, SynBalance® ProBeautyShield 2.0 demonstrates a significant improvement of skin profilometry in terms of skin moisturization and skin complexion with visible results already after 28 days of treatment and efficacy permanence long-term after the end of intake.